Remove the tough outer leaves from the lemon grass stalk. Smash the stalk with the flat blade of your knife and chop. Combine the lemon grass, garlic, ginger, cilantro root, honey, lime juice, chile pepper, and 1 teaspoon of the peanut oil in the jar of a blender and puree until chopped and makes a paste. Bring a large pot of water to a boil. Add salt. Stir in the noodles and cook until al dente, 3-4 minutes or according to package directions. Drain the noodles and divide among 4 large soup bowls. Add the paste to the same skillet you cooked the fish in and cook and stir over medium heat until fragrant, 1-2 minutes. Stir in the broth, coconut milk, fish sauce and sugar and bring to a low boil, reduce the heat and simmer about 5 minutes. Add the fish and kale and simmer 2-3 minutes more, until the fish is cooked through. Turn off the ehat and add cilantro leaves. 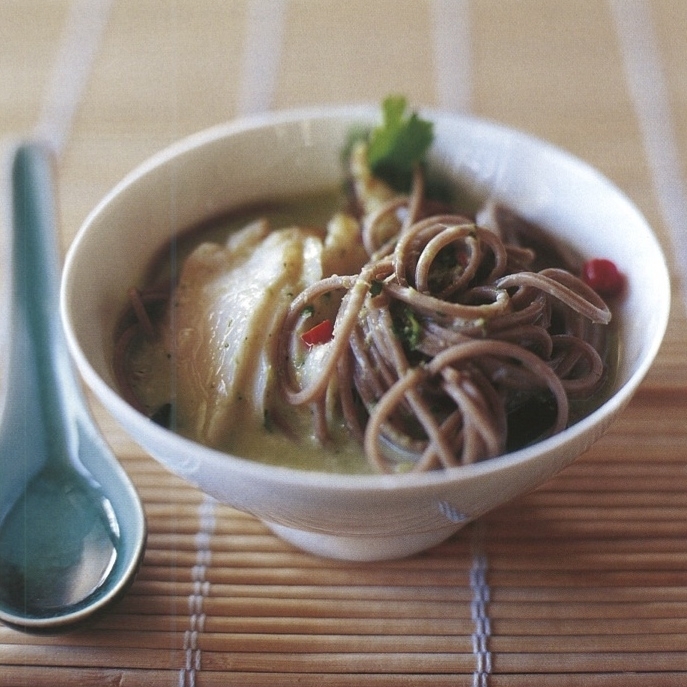 Carefully scoop out a piece of fish for each bowl and place on top of the noodles. Ladle the broth and kale on top.- over the fish and noodles. Serve warm.